Picture the scene. You and five of your favourite friends cruising around the so-called Magic City, living your best lives on a stunning 22.5 metre yacht with a mooring in the coveted South Beach. Firmly out of your daily routine, you’ll spend your days doing exactly as you please; from making the most of the golden sand bays and bath-like sea, to hitting up the many designer stores that line the Collins Avenue District. Every day brings a new district to explore, every evening a new VIP clubbing experience. Discover true beachside extravagance. Your Miami yacht charter itinerary should include the creme de la creme of sunbathing spots, incredible sh-opportunities and party destinations. 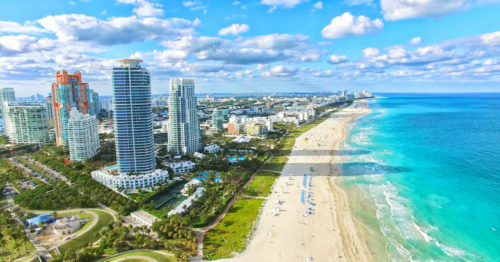 South Beach already offers sparkling turquoise waters and near-permanent sunshine, but if you fancy a change of scene why not try cruising over to breathtaking Biscayne Bay, exploring famous Miami Beach, sailing to the elegant Bal Harbor or visiting the white sands of Sunny Isles Beach – just some of the city’s most famous seaside hotspots. Time to hit the shops? Lincoln Road in South Beach promises small boutiques, whilst the iconic Versace store on Washington Avenue is well worth a trip. Miami is a true designer paradise. As day turns to night, the entire city lights up in anticipation of the amazing evening ahead. Head to one of the many clubs in South Beach or Coconut Grove, or visit the legendary Ocean Drive. A street full of vibrant beach bars, this area says Miami like nowhere else. If you want to explore further afield this can also be worked into your Miami yacht charter itinerary. Indeed, you only need to cruise for a few hours to reach beautiful destinations like Florida Keys or even the Bahamas. The gorgeous 160 km long island chain of Florida Keys start in the south of Miami and stretch all the way out to Key West, about a 3 hour journey from South Beach. Meanwhile, you could discover secluded Caribbean beaches and swim with friendly dolphins and manta rays in untouched coves in the Bahamas, only a 2.5 hour cruise from your mooring. You may well be thinking: surely this is out of my budget? However, SmartYacht is delighted to be able to offer fractional ownership of the Sunseeker 74 Predator from just $549,000 for a third share of the vessel, meaning this dreamy Miami yacht charter itinerary is more affordable than you would think. The Sunseeker 74 offers a chic modern interior and state-of-the-art equipment, with 3 comfortable double cabins for 6 guests. Enjoy a glass of champagne with a view of the Miami skyline or let off steam by speeding off into the sunset. Equipped with 1800 hp MAN engines, this yacht’s top speed of 38 knots is sure to keep you on the edge of your seat. And with toys including jet tenders and jetskis, there is no end to the onboard entertainment. Let your crew take care of your every need and desire as you live it up in the Sunshine State. Just contact us online or give us a call on +423 79 39355 if you are interested in co-owning this vessel. We are very happy to help.